https://www.painfulpleasures.com/14g-threaded-steel-replacement-ball-various-sizes.html?___store=1 2232 14g Stainless Steel Replacement Ball- 3mm-10mm https://cdnstoremedia.painfulpleasures.com/media/catalog/product/e/x/external_steel_balls.jpg 0.49 0.49 USD InStock /Body Jewelry/Straight Barbells /Body Jewelry/Body Jewelry Parts /Body Jewelry/Body Jewelry Parts/Threaded Ends /Body Jewelry/Body Jewelry Parts/Threaded Ends/Externally Threaded /Body Jewelry/Straight Barbells/Surgical Steel Straight Barbells /Body Jewelry/Straight Barbells/Tongue Barbells 14g Stainless Steel Replacement Ball-3mm-10mm- Price Per 1 Ball Looking for a change in ball size? Or maybe a ball fell off and is never to be found again. Whatever the case our steel replacement balls are sure to settle any ball issue. The balls are crafted from 316L ASTM F-138 Implant Grade Stainless Steel that has been polished to a remarkable high shine. Each ball features 1.6mm external thread pattern. 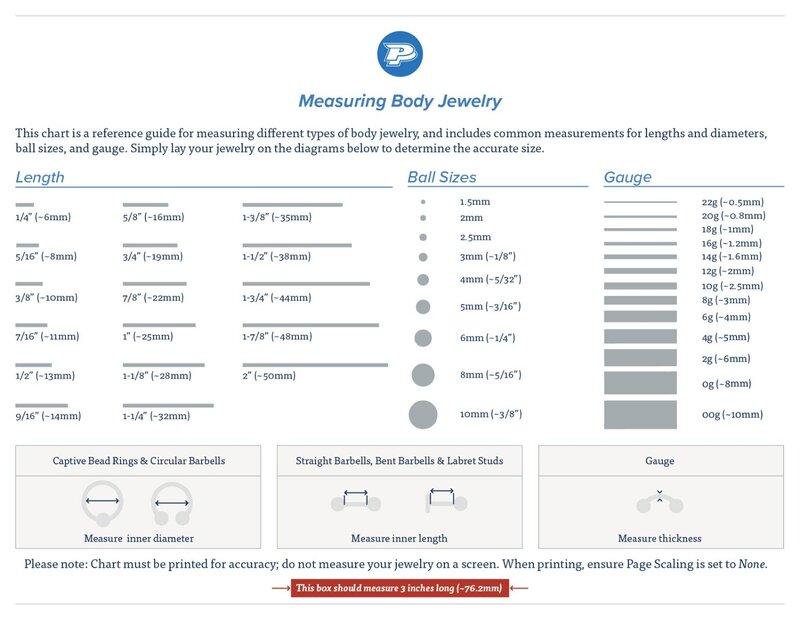 These balls are available in sizes 3.0mm through 10.0mm. These are generally used with 14g jewelry with external 1.6mm threading. 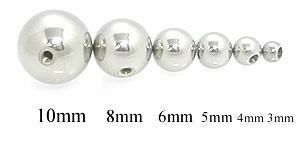 Specifications: Ball size: 3.0mm through 10.0mm (choose size from drop-down menu) Material: 316L ASTM F-138 Implant Grade Stainless Steel Threading: External 1.6mm High polish shine Priced per 1 ball USD 3 5 2233 14g Threaded Steel Replacement BALL - Various Sizes - 8mm ~ 5/16" 0.58 0.58 https://cdnstoremedia.painfulpleasures.com/media/catalog/product/e/x/external_steel_balls.jpg InStock 8mm ~ 5/16" 2234 14g Threaded Steel Replacement BALL - Various Sizes - 10mm ~ 3/8" (UB219) 0.64 0.64 https://cdnstoremedia.painfulpleasures.com/media/catalog/product/e/x/external_steel_balls.jpg InStock 10mm ~ 3/8" 2235 14g Threaded Steel Replacement BALL - Various Sizes - 3mm ~ 1/8" 0.49 0.49 https://cdnstoremedia.painfulpleasures.com/media/catalog/product/e/x/external_steel_balls.jpg InStock 3mm ~ 1/8" 2236 14g Threaded Steel Replacement BALL - Various Sizes - 5mm ~ 3/16" 0.49 0.49 https://cdnstoremedia.painfulpleasures.com/media/catalog/product/e/x/external_steel_balls.jpg InStock 5mm ~ 3/16" 2237 14g Threaded Steel Replacement BALL - Various Sizes - 4mm ~ 5/32" 0.49 0.49 https://cdnstoremedia.painfulpleasures.com/media/catalog/product/e/x/external_steel_balls.jpg InStock 4mm ~ 5/32" 2238 14g Threaded Steel Replacement BALL - Various Sizes - 6mm ~ 1/4" 0.5 0.5 https://cdnstoremedia.painfulpleasures.com/media/catalog/product/e/x/external_steel_balls.jpg InStock 6mm ~ 1/4"